Same as everybody else's review - - this thing is amazing. How many times can we write "hot knife through butter" ? How many times can reviewers repeat that the saw is stable and quiet, and makes satiny smooth cuts, that tool changes and adjustments are easy? I think I read some comments that the barrel grip has a bit of a learning curve. I don't know why - - I just grabbed it and got to work. I've gone through 3 other jig saws in my woodworking career and now that I'm doing it commercially, this is the only one that can handle the work. From custom cabinets to framing, this is the saw I needed all the while. This is the best Jig Saw I've ever owned, and I've had Makita, Milwaukee, Dewalt and Craftsman / B&D. This is the best balanced of them all for doing any kind of crown molding installs. It's small body with a coping foot attached is by far the best time saver any trim installer could own. It does get hot when used for long periods of time, so watch your hands....Ouch! I have been in the carpentry field for over 30 years, this is the best jig saw I have ever used. Bought this for coping crown molding with the collins coping foot. It's nice. The only thing for me, because I am using this upside down to cut the molding, is that the metal housing gets a little hot when I've got it cutting for a while. Not a bad thing because I am holding it in a way not directly the way it was designed for use. This is the second barrel grip jigsaw I've owned by Bosch. I really like this style. I was surprised to still be able to find these available. I can remember using these back in the 90's and on the job we didn't want to touch another jig. In fact my friend cared for this tool like it was a child always boxing it up when finished. On a construction site most tools just get plopped in the tool box. I was always surprised no one else really copied this style. I think Makita makes a similar design but apples to apples they don't compare in my opinion. I seem to remember the Makita being much heavier and expensive. 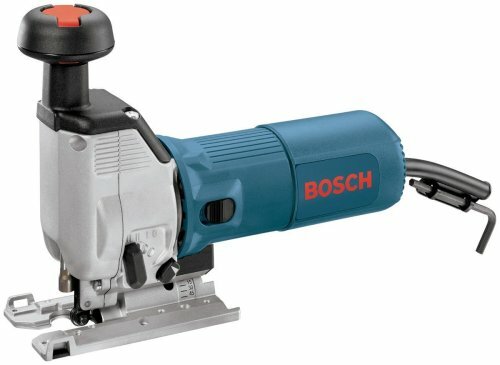 Bosch really did right when they designed these. My old one still worked fine,..the only thing I had done on it was the old on the job cord replacement. That's when you chop an extension cord and give your tool a new lease on life the fast way. The only jig currently on the market for me! I previously had a small, low cost B&D jigsaw. I decided it was time I switch to something more stable, more powerful. And this one does that and much more! It feels so stable with no blade deflection, you can make clean cuts even on the top face and with a coarse blade. Of course you will get better results with more precautions, but that shows the difference in quality. This is definitely one of my top tools. I bought this saw and have used it a lot in refurbishing an old house. It is a powerful and excellent saw and it cuts exceptionally true even through very thick stock. The only problem some people might have with it is that it is quite large and heavy. I have large hands so this is not a serious problem but thank God I did not buy the even larger Bosch model which is REALLY huge! Also, changing blades is a pain if you do not do it all the time since the procedure is overly complicated. No wonder they put it on the barrel of the saw! I have to admit I was shocked how much easier it was to control this saw with the barrel grip. There is only one thing I would change, although minor, it would be nice if the variable speed control was located on the front of the saw. Overall I would highly recommend this product to both the weekend warrior and the profesional contactor / master carpenter. You will not be dissapointed.